Beautiful Qawwalis – 5 you may not have heard! Red Baraat – London and Bristol Shows! Debashish Bhattacharya – Bristol Concert! Harshdeep Kaur – UK concerts announcement! Naseebo Lal – Watch Colston Hall Highlights and Audience Reactions! Barmer Boys Debut UK Tour 2016! Sain Zahoor 2015 Tour: Highlights! Festival Season with Asian Arts Agency! Sanju Sahai will accompany Hindustani slide guitar maestro Debashish Bhattacharya, on Monday 26 March. 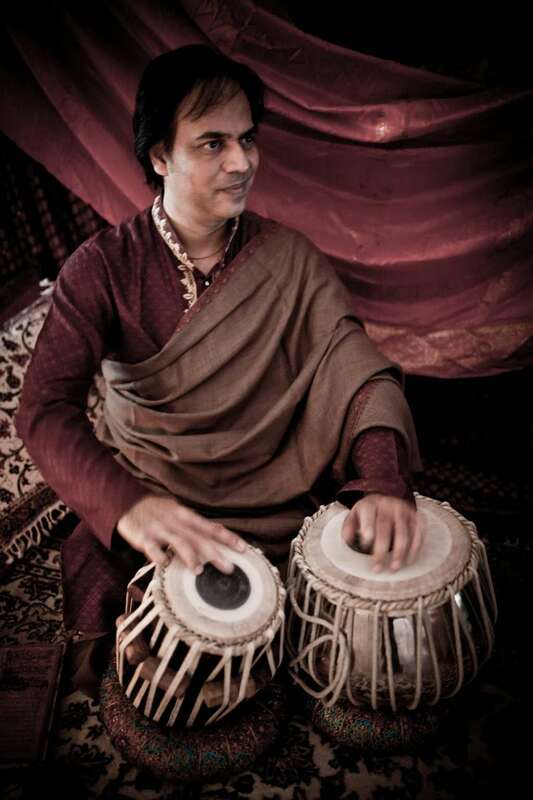 Born into a traditional lineage of tabla players, Sanju Sahai’s ancestors are prolific tabla players. The torchbearer of the 200 year old Benares tradition is one of the finest and most sought after tabla players of his generation. We explore some interesting facts and get to know the artist and gharana better. 1. The founder of the Benares lineage was Pandit Ram Sahai Ji (1780-1826). It is said that he played for seven consecutive days for nawab Wazir Ali Khan. 2. The Benares gharana was founded when Pandit Ram Sahai Ji decided to go into seclusion for 6 months. 3. Pundit Durga Sahai Ji was a favourite accompanist of Ustad Inayat Khan, one of the most influential sitar and surbahar players of India. 4. Pandit Sharda Sahai Ji, Sanju Sahai’s father, is regarded as one of the ambassadors for spreading awareness on the tabla both in the East and West. 5. Sanju Sahai started off as a child prodigy. he gave his first performance at the age of 9 at a prominent Benares festival. 6. At 13 he gained his Bachelor of Music and at 19, Master of Music. 7. Sanju Sahai has accompanied prolific artists including: Pandit Hari Prasad Chaurasia (bansuri), Pandit Shiv Kumar Sharma and Pandit Bhajan Sapori (santoor), Ustad Vilayat Khan Saheb, Ustaad Imrat Khan Saheb, Ustaad Shahid Parvez, Pandit Ajoy Chakraborty -this is just naming a few! 8. Sanju collaborates with various international artists from around the globe, including: Manuela Carrasco (Flamenco dance), Michael Nyman (British composer), Patricia Rozario (opera), BBC Philharmonic, Naresh Sohal (composer), Pete Lockett (multi percussionist), Yair Dalal (oud), Jason Carter (guitarist), Matthew Barley and Anup Biswas (cellists), Don Li (clarinet), Harp Quartet, Dominique Vellard (Gregorian chant), Gilles Petit (composer and instrumentalist) and the acclaimed dancer Akram Khan. Get tickets! Sanju Sahai to accompany Debashish Bhattacharaya in Bristol! Asian Arts Agency presents Debashish Bhattacharya on a USA & Canada tour. Asian Arts Agency presents the guitar maestro Debashish Bhattacharya and trio on a UK and European tour. Anandi Bhattacharya performs material from her acclaimed debut album Joys Abound.